PAINTING MAGICALLY APPEARS - Pour in a hot liquid and watch a happy little painting appear. 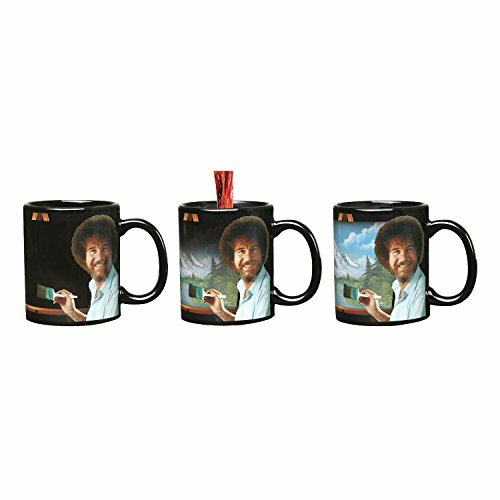 TELEVISION ICON BOB ROSS - Mug features the smiling image of iconic PBS painter Bob Ross and one of his favorite quotations, "There are no mistakes, only happy accidents." FUN COLLECTABLE - The perfect addition to your coffee mug set. MAKES A GREAT GIFT - Any Bob Ross fan will love watching this landscape appear and disappear. 11 OUNCE CERAMIC MUG - Hand wash and avoid microwave to preserve the color changing effect. If you have any questions about this product by WHAT ON EARTH, contact us by completing and submitting the form below. If you are looking for a specif part number, please include it with your message.